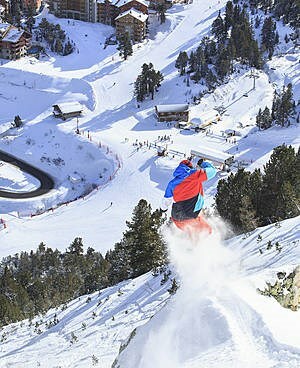 If you are a fan of real thrills and extreme sports, come and have a go in the Les Arcs snowpark. Situated just above Arc 1600 in the Paradiski ski area in Savoie, the Apocalypse Park is groomed daily so that you can practise snowboard or freestyle skiing in a quality spot. It has several modules for beginners, intermediates and experts. The rails and boxes on blue, red and black runs are adapted to different levels so you can progress at your own rhythm. Contests and other events are regularly held in the park to the great delight of those watching. The Les Arcs snowpark is open to riders from mid-December to the end of April, according to snow conditions. You can take Bois de l’Ours chairlift or the inter-resort bus that runs between Arc 1600 and Arc 1950 to get to the snowpark.